For learners taking the qualification in 2014 or after, you will take two exam papers. 1. How will you be tested? · Answer 30 multiple choice questions. · Each question has four possible answers, A, B, C and D.
· Each question is worth one mark. · Paper 1 is worth 30% of the total marks of your Cambridge O Level in Economics. · Answer the compulsory question (Question 1) in Section A. · Information and data will be given for the interpretation and analysis of a real economic situation. · Question 1 is worth a total of 30 marks. · Answer three questions in Section B from a choice of six. · Each question in Section B is worth a total of 20 marks. · Paper 2 is worth 70% of the total marks of your Cambridge O Level in Economics. This section gives you advice to help you do as well as you can. Some of the tips are general advice and some are based on the common mistakes that learners make in exams. · Read each question carefully and make sure you know what it is asking, and what you have to do, before you begin your answer. Focus your answer on the question – do not write about something else. a) You may answer a question about inflation and write all you know about its causes and consequences, but the actual question asked wanted you to write simply about how it is measured. b) You could be told that ‘Low unemployment is one of the aims of government policy. Choose two other macro-economic aims of the government and explain what they mean.’ Some candidates may ignore the word other and explain low unemployment as one of their two aims. No marks would be given for that part of the explanation. c) For longer questions, check every so often to make sure that you are answering the question correctly. · Look at the command (directive) words in the question. These tell you what we are looking for. a) Identify or state means you do not need to write very much – just show the examiner that you know the answer. b) Define means you need to show you understand the meaning of an economic term or topic and distinguish means you need to show you understand the differences between two or more terms. c) Describe or explain means you need to go into more detail, clearly showing you understand what something is or how something happens – ideally giving a relevant example, or using a diagram, to help your description or explanation. d) Analyze, discuss and to what extent require you to go into much more detail and your answer should be longer and include relevant examples and/or diagrams. You will usually be expected to look at something from two contrasting points of view and then come to a reasoned and well supported conclusion. Full sentences and paragraphs should be used – avoid bullet points. · Look at the number of marks for each part of a question. This should guide you as to how long you should spend on it. Some questions will only gain you two or three marks while others may be worth as many as ten marks. · Wherever possible, use a diagram to aid your explanations and make sure that it is accurately drawn and correctly labelled. Ensure that you refer to it in your answer and demonstrate to the examiner that you know what it shows. a) Sometimes questions require you to include a diagram to score full marks. Phrases in the question, such as, ‘with the help of a demand and supply diagram’ will tell you when you have to do this. · Use appropriate and relevant economic examples wherever possible to support the points you are making. a) Sometimes, a question will require you to include specific examples of something, e.g. ‘Distinguish between direct and indirect taxes with the use of examples.’ If you don’t include any examples of these different types of taxes, you would lose marks. b) Some parts of Question 1 in Paper 2 will require you to include an example from the extract provided. You may be asked, for instance, to ‘Identify and explain one example of opportunity cost from the above extract’. If you identify and explain one that was not in the extract provided, you would not gain any marks. · Don’t write out the question; this is a waste of time. Just make sure that you write the number of the question, and the sub-part, so that the examiner knows which question you have answered. · Manage your time carefully. Don’t spend too long on some questions and leave yourself without enough time to finish the paper. You should also try to leave time to read through your answer and correct any mistakes and/or add anything that you feel is missing. So you should do four questions in total. Each year, however, there are always some candidates who answer more than four questions. There are even some candidates each year who answer all seven questions. This will have been a waste of their exam time as no more than four answers can be accepted. 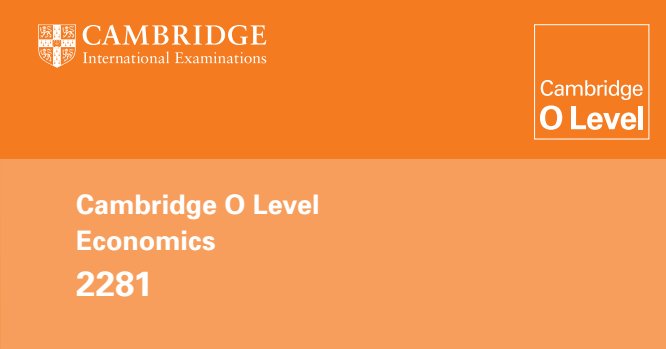 The syllabus sets out the three assessment objectives in Cambridge O Level Economics. The following table shows the relationship between the assessment objectives and the different examination papers. The assessment objectives are weighted to give an indication of their relative importance. They are not intended to provide a precise statement of the number of marks allocated to particular assessment objectives.